This school of magic allows past events to be changed to mesh with current needs. It is theorized that only the Titans have access to the powers of Retconjuration as it is too powerful for a mere mortal to comprehend even its smallest of ramifications. Being a very volatile subject, it is usually avoided in most public forums and viewpoints on the subject differ greatly. Mortal users of Retconjuration would be in position to engage each other in a war of existential reconstruction, up to the point that only a timeline where they were all erased would be stable. Of course, as there have been no mortal Retconjurers, then either this is impossible or it has already happened. 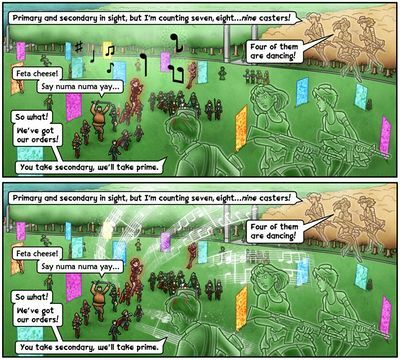 The school of Retconjuration is notable for being an example of itself; the Numbers axis of Naughtymancy was an entirely different school called "Deletionism" WoT-8/19/2009 until the Titans realized that Retconjuration would be necessary for them to properly maintain Erfworld. As a removed school of magic, this also kind of makes Deletionism an example of itself. When Parson first spoke with Wanda via Thinkamancy at the beginning of Book 2, he was not wearing his mathamancy bracer. This was then quickly Retconned so that he was wearing it. Compared to the webcomic, Erfworld's Volume 1 book has a number of changes (which may be considered a sort of Retconjuration), as listed on the wiki page Book 1 Print Discrepancies. Also of note is that immediately above (following the word 'printing'), there is a link where Rob and Xin both recount and illustrate the above story. Currently, it is only correctly visible by those who pledged to the 2012 "Erfworld Year of the Dwagon" Kickstarter. The Arkenshoes were originally silver, but retconned to be ruby. In the book the Wizard of Oz, the shoes are the Silver Slippers, but changed to Ruby Slippers for the famous movie. When writing LIAB Epilogue 08, Balder forgot which revelation he had been intending to reveal, and thus repeated the revelation that Decrypted can turn. He replaced it with the revelation that Wanda can use an Archon's natural Thinkamancy to see through their eyes. The text of the LIAB Prologue 16 was retconjured: The description of the City of Faq was changed to match with the illustration found in LIAB Epilogue 21. LIAB Epilogue 25 was first released as a video, and showed Archons in the Charlescomm capital glowing an ominous red. Forum speculation quickly went rampant that Charlie had analyzed one of the captured decrypted units and figured out how to decrypt his archons so that Wanda would be unable to uncroak them. The glow was quickly retconjured to blue. LIAB Prologue 7 was changed to explain Stuffamancy, and especially Changemancy, in more detail. A klog initially stated that captors payed a fugitive's upkeep. This was later changed to be consistent with IPTSF, where Jillian had to forage her upkeep to avoid automagical capture. Hvs.tCF 33 originally showed the Jetstone radish on the garrison building of Spacerock, despite the fact that it's Signamancy should have switched to Gobwin Knob due to having been conquered. This was later switched to Stanley's livery. Hvs.tCF 43 had Parson state that the Spacerock was now a level 4 and that Sizemore was using his juice to make improvements each turn to lower the cost of bringing it back up to level 5. Hvs.tCF 51 contradicted this by having Sizemore be depressed about the city not having his personal touch as Parson auto-magically upgraded the city back up to level 5 the turn after the battle while everyone was still in the Magic Kingdom. This was again contradicted by Stanley who said the city was level 4 on Hvs.tCF 71. Due to the discrepancy, Hvs.tCF 51 was retconjured to state Spacerock as a level 4. Hvs.tCF 66 originally had round necklace on Bunny rather than triangle, an incorrect shade of orange on the bag (fixed to be more saturated) and a different interior of the portal room (changed to be in line with the image from Hvs.tCF 140). The necklace was also later fixed on other pages (this includes Hvs.tCF 67 and Hvs.tCF 76). Hvs.tCF 113 originally had Lilith throwing the corpse through the portal with many, subtle motion lines that could be incorrectly interpreted as if the portal is sucking her in. It was later retconned to a simpler, more obvious set of lines. Hvs.tCF 118 originally had a Maggie visible in the second panel. This was later fixed to have her properly veiled. Hvs.tCF 119 originally had the close-up pane of Maggie's pendant display an omega symbol. This was later fixed to display an eye. Hvs.tCF 128 originally showed Wanda without the Arkenpliers. This was quickly corrected. Hvs.tCF 129 originally showed the spell effects of Rhyme-o-mancy as black notes with atom symbols. This was changed to a white musical score radiating from the Decrypted Rhyme-o-mancer. Hvs.tCF 136 originally listed Lizzie as a decrypted archon whose shot Bonnie heard along with Sandy's after croaking Beth Knell, but it was later changed to Raven. Hvs.tCF 163 originally had spaced out word balloons, the lettering was changed to clarify that Chief Warlord Antium was speaking, and referring to Bonnie. Hvs.tCF 156 was modified to replace one of the Qualified casters with Roger Victor Clarence and change the coloring of the caster to his left to match Hvs.tCF 163. One line of fan speculation postulates that there could be a Retconjuration war going on between the Titans, with one faction backing Stanley the Tool's bid to overthrow royalty and unite the Arkentools, and the other opposing it. So far, the side opposing Stanley has left an extra gem in a Marbit mine, leading to Stanley's defeat at the Battle of Warchalking, and the other has caused Lookamancers and Findamancers to research the "Summon Perfect Warlord" spell, or possibly provided Parson's glasses, bracer and sword, leading to the defeat of the Royal Crown Coalition. The name refers to "retcon", short for "retroactive continuity", in which the history of a fictional setting is changed after publishing to mesh better with the current desires of the author. Ironically, Retconjuration is itself the product of a retcon; the Naughtymancy class previously aligned with Numbers was known as "Deletionism" before it was replaced with Retconjuration. This page was last edited on 29 March 2017, at 18:21.